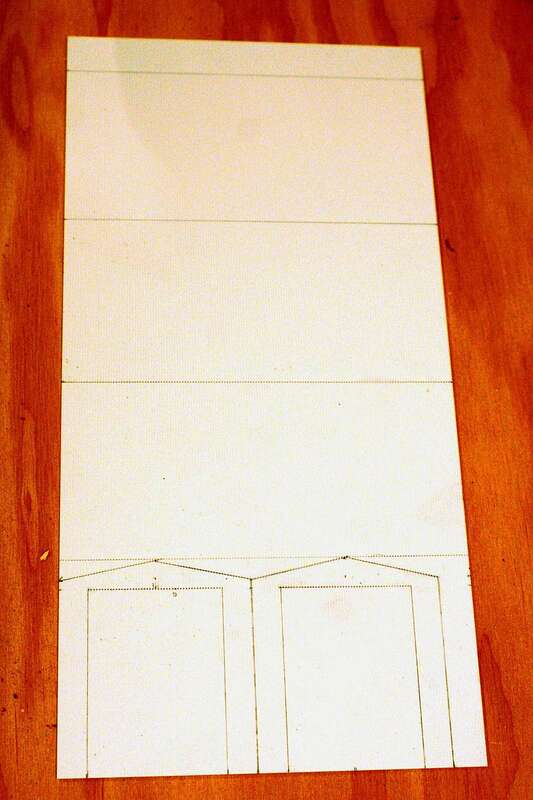 The four walls are laid out on a single sheet of styrene. Note that three "long" walls are needed to end up with two of the final length. ©2011 Ryan C Kunkle, licensed to About.com, Inc. The structure of the coal shed itself requires only a few basic materials and tools. The building as seen here is designed to fit over the pit and foundation, but you could build the structure on a solid base. In addition to these materials, some small strips of .030 styrene (you could also use heavy cardstock) and a door were used from out of the scrapbox. All of the walls can be laid out on a single sheet of styrene. Begin with the two end walls. All dimensions are in scale feet. Each end wall is 20 feet wide. It is also 20 feet from the base to the bottom corners of the peaked roof. The total height of the roof is 22 feet. The large doors for the trains are 14 feet wide and 19 feet tall and centered on the walls. The side walls are 20 feet tall and 57 feet long. Unfortunately, this sheet of styrene is only a scale feet wide. Lay out three 20 foot tall strips above the peaked end walls. The third will be cut to length later. See the photo for guidance if necessary. As you can see, there is not a lot of waste. Use a pencil with a sharp point. Measure from the "0" on the scale rule, not the edge. Use the ribs on the siding as a guide, but don't let the marks wander into the channels. Once laid out, the walls are cut with a straight edge and a sharp hobby knife. ©2011 Ryan C Kunkle, licensed to About.com, Inc.
Once laid out, the walls of the shed must be cut from the styrene sheet. Make all of your cuts with the ribbed side of the simulated metal siding up. If you have never worked with styrene before, you'll want to review these basic tips for cutting styrene before you get started. Begin with the large doors on the end walls. Next seperate the end walls and the side walls. Cut the peaked roofs and seperate the end walls. Seperate the three side wall sections. Measure 13 feet 9 inches from each end of the third wall section to make the complete 57 foot wall lengths. Before you begin assembling the walls, add a door near the right corner on the front wall. The exact style and location of the door is not critical. The door used here came from extra parts from a Pikestuff kit. Measure the door, mark the wall in the appropriate location and cut out the wall panel. Test fit the door and file the walls until you get a snug fit. Fix the door in place with styrene cement, gluing from behind. 90 degree angles are glued into the four corners to join the walls and provide additional support. Two more angles will be used to splice sections of the longer walls of the building. ©2011 Ryan C Kunkle, licensed to About.com, Inc.
Use the Plastruct 90505 angle to attach the four walls. The same angles can be used to splice the longer side walls together. Flat stock would work too, but with more than enough angle in the pack for this building, the extra support comes at no cost. The angles are also extended below the bottom of the walls about 3/8". This will allow the posts to key into the foundation made for the building. If you are putting the building on a solid base, cut the corner posts even with the bottom of the sides. The angles are easy to cut using a pair of sprue nippers. Glue the posts to the ends first, using another side sheet to confirm the right alignment while the glue sets. You will have a few seconds to make final adjustmetns while the cement cures. The end walls will overlap the side walls on the exterior. Since the .040 thickness of the styrene is the same as the width of the corregations on the siding, the seem will be practically invisible as long as your cuts and joints are square. 90 degree angle is used to join the corners and also to stiffen the lower edge of the wall. Later, this will also support the floor panels on this part of the shed. Notice the back of the door casting cut into this side. ©2011 Ryan C Kunkle, licensed to About.com, Inc.
Use the same Plastruct angle stock to reinforce the walls. Add a strip along the bottom edge of each of the side walls. This will keep the walls from bowing and will also help support the floor later. With the walls completed and attached, the coal shed is beginning to take shape. Note the extended corner brackets which will help seat the structure in the layout. ©2011 Ryan C Kunkle, licensed to About.com, Inc.
Now the coal shed can finally start to come together. Glue the completed side walls onto the corner brackets of the end walls. Make sure everything is even and square. It is a good idea to test fit the building on the foundation at this time. Next it's on to the roof. A thin strip of styrene is glued to beneath the peak of the roof. A gentle score will allow this joint bar to snap and bend to the proper angle without seperating - holding the roof panels together. ©2011 Ryan C Kunkle, licensed to About.com, Inc. The simulated metal roofing for the shed comes from Evergreen sheet No. 4521. This includes a .040 thick sheet with scribed grooves. On this sheet the grooves are spaced 3/16" apart. Different sized panels are also available. Thin styrene strips are then inserted into the grooves and trimmed to length to create the ribs. It is easiest to install those after the roof is in place. Make two sections of roof, each 11'x 58'. This worked out to an even 25 panels and will provide a small overhang on the ends and side. Remember to keep the grooves running up and down. To join and support the two roof sections at the peak, you'll need to make an angled support strip. I used a scrap of styrene about .030 thick and about 1/2" wide. Make the strip as long as the roof. Draw a line down the center of the strip lengthwise. Score this line lightly with a hobby knife. Apply styrene cement to one side of the strip and attach one roof panel. When the glue has dried, attach the second panel in the same way. Make sure to keep all of the grooves in line. Once dry, bend the roof to the approximate angle of the roof. The bracket should snap and bend but not break. Set the roof aside for a few minutes while you add brackets to the walls to mount it to the structure. The roof has been bent to the approximate angle. Additional braces have been attached to the tops of all four walls; 90 degree angle on the ends, and custom-beveled along the sides. ©2011 Ryan C Kunkle, licensed to About.com, Inc.
To attach the roof to the walls, additional brackets will be needed. Make two additional brackets for the long walls just like the one for the roof peak. These will need to bend to a sharper angle, but the methods are the same. Make sure to keep the strip parallel with the top of the wall. Use short sections of Plastruct 90 degree angle on the end walls. Glue all of the supports to the walls and let them dry completely before attaching the roof. With the roof panels bent to the proper angle, everything is glued in place. Take care to ensure an even overhang all around. ©2011 Ryan C Kunkle, licensed to About.com, Inc. Gluing the roof to the shed is one of the more difficult parts of the project. The Plastruct Weldene cement will give you a little bit of working time to get everything properly aligned, but once it sets the position will be final. Do a dry fit first. Check the that the angles along the side walls are at the right angle and that the roof itself as enough of a bend. You can also mark the underside of the roof to help keep the overhangs on all four sides even. When ready, apply cement to all of the brackets. Hold the roof in place until dry. The roof may want to lift up from the tension on the support at the peak. Once the glue sets, everything will hold. All that is left is adding the final roof details! The most labor-intensive part of the whole project - installing the individual bands on the metal roofing. The process is easy, but with 84 tiny styrene strips to glue, it isn't fast. ©2011 Ryan C Kunkle, licensed to About.com, Inc.
All that remains are the roof details for the simulated metal roofing. This last step is not particularly difficult, but with 48 strips to apply it is one of the more time-consuming. You probably have a small gap along the peak of the roof. Insert one of the thin styrene strips that comes with the Evergreen kit into the gap, glue and trim to length. This will be the cap on the top of the roof. Begin installing the remainder of the strips in the grooves. Apply a little glue to the bottom of a strip. Insert the strip into the groove all the way to the peak and seat it completely. Let the glue set for a few seconds and then trim the strip to length with sprue nippers. Repeat until all of the strips are installed. The finished structure is ready for painting. ©2011 Ryan C Kunkle, licensed to About.com, Inc.
That's it! Your coal shed is complete - at least the styrene scratchbuilding part of it. Take a minute to test fit the model on the layout and enjoy your progress. Next the model will be painted and weathered. Then it's lighting and installation, including the floor.